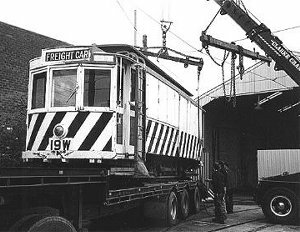 M&MTB 19W (originally NMETL 4) at North Fitzroy being transported to Bylands. The TMSV is undertaking two tramcar restoration projects at the current time (January 2006). The first project is the completion of restoration on NMETL 4, which we are seeking to have done commercially, and as a result we are negotiating for funding with a number of parties in order to have this car ready for the celebration of the centenary of electric tramways in Melbourne later this year. The second project, which is being undertaken in-house in the Exhibition shed workshop, is the conversion of the former works tram 16W back to its condition as Q 199 in all-night tramcar configuration, as it appeared in 1936-37 in chocolate and cream livery. Doug Prosser is the project manager, assisted by Bill Johnson. Current work is focused on removal of the Colourflek paint from the interior in order to restore the original varnished timberwork. Along the way, Doug and Bill are finding (and cursing) the pink paint that covered this tram in its guise as the 1963 Myer-sponsored Christmas tram. Progress on this car is steady, and excellent results are being observed. We look forward to the completion of this project this year. Last updated 15 January 2006.